Today I am doing ring kabab. To keep the original recipe I used soya sauce and garlic, but if you are not into soya sauce like me, you can use white vinegar and ginger. 1. Tenderize the fillet with and marinate soya sauce for 10 minutes. 2. Spread tomato sauce, chilli sauce, garlic and salt on chicken breast. 3. Boil the carrot in salty water for 2 minutes. 4. 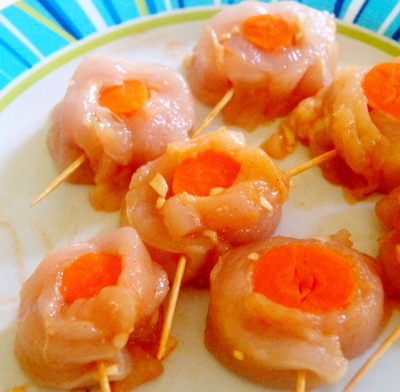 Place the carrot on chicken breast and roll the breast. Cut the breast about .35″ wide ring. 5. Seal every ring with toothpick and fry it till chicken is cooked. 6. 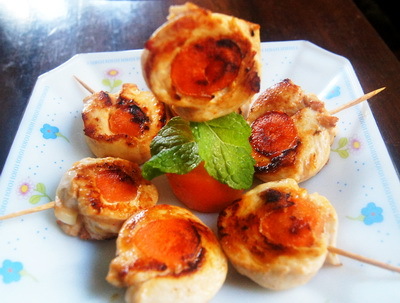 Serve ring kabab as a great snack or appetizer. Thanks. Please try it and share your experience…. Its round and its Kebab! Kudus to bangladeshi recipes, loved this.